A student and scholar of comedy, Norm Macdonald finds David Letterman mysterious. Any time Macdonald appeared on Letterman’s Late Night and Late Show, he elevated his game, translating his nervous energy into a laser focus so that he could entertain the host, as much as possible. The audience was secondary; Macdonald, more than just telling jokes and compelling anecdotes, seemed to be there to probe an enigmatic yet formative force in his life. And so, as David Letterman has purposely been rather present since leaving his talk show behind, making a number of public appearances that still seem rather exclusive, he made good on a promise to his friend, and was a guest on the ‘season 3 premiere’ of Macdonald’s inconsistently available audio/video podcast, Norm Macdonald Live. And, just as they had a unique host-guest chemistry in the past (which cemented Macdonald’s status as the greatest talk show guest of all time), this meeting is magical—monumental, even. What most concerns Macdonald here is what made Letterman think he could be a talk show host when he left Indiana for Los Angeles. That’s all Letterman wanted to do really, which baffles Macdonald who makes a telling point: unlike today’s landscape, which features a million men who host talk shows and each aspire to be the ‘king of late night,’ when Letterman had that desire, there was really only his idol, Johnny Carson. Carson was almost exclusively the late night talk show host—a guy everyone in North America agreed they’d all watch and then discuss the next day. Now, that kind of cultural galvanization is impossible, which prompts Macdonald to ask certain kinds of questions. 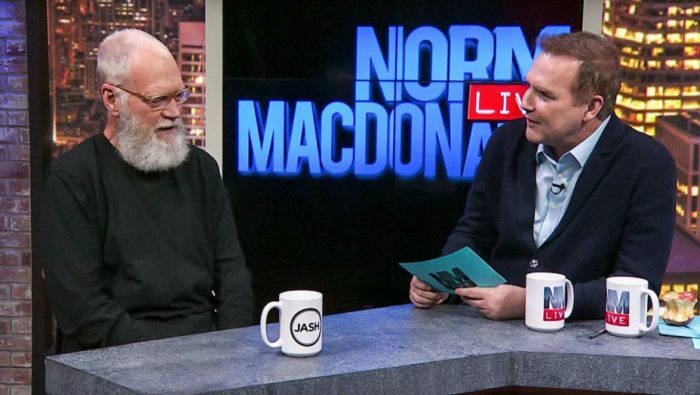 Throughout this episode, Macdonald gets Letterman to reveal all manner of things. Letterman talks about the rough, early days of his show biz career, his clinical, psychiatric assessments, how he began his professional relationship with Paul Shaffer, he goes into great, whimsical detail about his shocking heart surgery, why having a desk might well be the most important talk show convention, the history of talk shows (the podcast seems to be filmed with uncomfortably tight shots of people’s faces in tribute to NBC’s old Tomorrow Show), whether or not he slept with Mary Tyler Moore, the time he met Richard Nixon, and an affinity he shares with Macdonald for the late, off-kilter comedian, George Miller. But on more than one occasion, Macdonald tries again to shift back to why. Why did Letterman think he could be a talk show host when the only job in that field was filled? Where did that audacity come from? And why did it work? Letterman is too modestly mindful of his ego to reveal how driven he must’ve been to pull this off but, in the asking, you can see why Macdonald reveres this man. Letterman had the talent and the motivation to create a job for himself that previously didn’t really exist. And then the kicker: he perfected it. It’s a relaxed, barely edited conversation and feels like the kind of long-form talk you want to experience again and again. Unlike previous episodes of NML, which often feel like free-for-alls that are occasionally crass and are only intermittently earnest (Macdonald has put a premium on comedy here, including a dedicated joke-telling segment on every show), this is two fathers of comedy, gently exhibiting their great innovation in communication. It’s stunning. I’m going to watch it again. 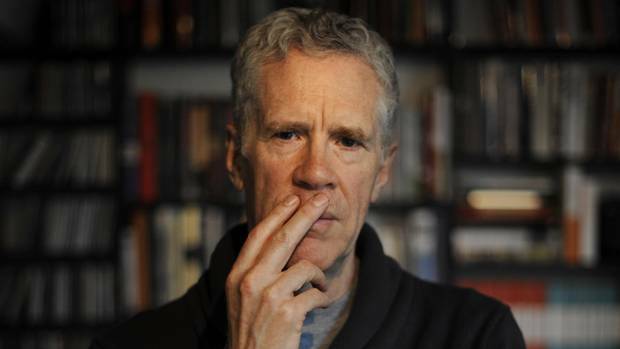 In my first few months working on-air at CBC Radio 3 in 2008, I came up with a bit wherein I did an impression of Stuart McLean’s popular program, Vinyl Cafe, but all the stories would be boring, vaguely dysfunctional ones about my own family. When I casually mentioned to colleagues that I’d invited Stuart to be on the episode, they all told me I was nuts. He was the biggest star in CBC Radio and I barely even worked there. Well, I asked him to do a thing and he did it. I wanted him to really lay into me for making fun of him and he was amazing. He went after me and my family with such funny ferocity that I was overwhelmed. He really enjoyed playing ‘Angry Stuart McLean’ and it was amazing. Afterwards, he told me it was great and he loved it. Total pro and forthcoming with his time. I’d see him at the Hillside Festival from time to time after that and he was always cool. I’m so sad he’s gone. By all accounts, he was good and generous man. That was certainly my experience with him. It’s worth noting that, at its peak, there’s no way a season of On Cinema at the Cinema would receive anything less than a perfect 10/10 or A+ rating. The show’s unique blend of film expertise and insightful conversation between host Tim Heidecker and recurring guest Gregg Turkington made it the logical heir to the classic Siskel & Ebert series about film criticism. With the sudden and recent departure of Heidecker at the end of last season however, On Cinema has been placed in a precarious position, as evident in its bizarre season six premiere. When Heidecker announced he was leaving the show and Hollywood for Jackson Hole, Wyoming at the end of season five, he rather begrudgingly suggested that Turkington could take over as host and that, unfortunately, is what has come to pass. There’s no disputing Turkington’s effusiveness for contemporary cinema and, at the best of times, his unassailable enthusiasm for movies and joy for life is infectious. Having said that, his first turn as On Cinema host this past week was a veritable trainwreck. 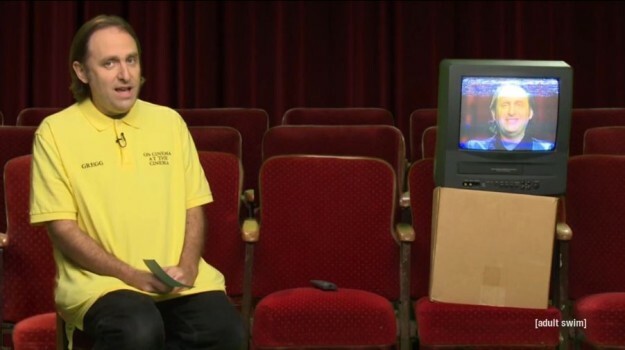 For some reason, Turkington’s own guest expert was a videotaped version of himself, appearing on a crappy VCR/TV combo mounted on top of a cardboard box. Every time the real Turkington pressed play on a remote so that he could correspond with himself or prattle on about completing his disturbing #501moviesIn501days project, it made Heidecker’s absence that much more painful to bear. That coupled with both Turkingtons delivering five-bags-of-popcorn™ reviews of Jupiter Ascending and The Spongebob Movie: Sponge Out of Water and an odd new segment called “Golden Age Comedies with W.C. Fields” rendered this episode useless and a disappointment.